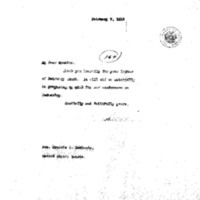 Woodrow Wilson thanks Francis G. Newlands for his letter. Thank you heartily for your letter of February sixth. It will aid me materially in preparing my mind for our conference on Wednesday. Wilson, Woodrow, 1856-1924, “Woodrow Wilson to Francis G. Newlands,” 1914 February 9, WWP18344, First Year Wilson Papers, Woodrow Wilson Presidential Library & Museum, Staunton, Virginia.